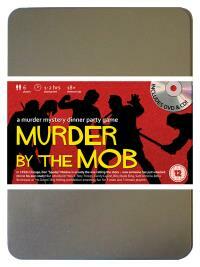 You've been invited to play the role of TONY TRICEPS in Murder by the Mob. Chicago in the late 1920’s is overrun by the mob, most of whom have been invited to "Spudsy" Malone’s party. However, when the Don welcomed everyone to celebrate the invention of his new potato alcohol drink, he wasn’t expecting any of them to "do him a favour" and shoot him in the chest. Join with us to find out who whacked the big potato! "The Amoeba" - Henchman (he flexes his body more than his mind!) Costume suggestion : Pinstripe three-piece suit is your favourite attire completed by thick rimmed glasses that aid your often questionable seeing ability. You prefer black shirts with a thin white tie for formal occasions and a fake tattoo that you draw on your knuckles that reads ‘M’ ‘O’ ‘M’ ‘M’ ‘Y’ so you can tell people to ‘Come to Mommy’. You and Spudsy go way back. When you were kids you’d hit anyone that said a wrong word about your best pal. You still do all his dirty work for him. The only thing that’s changed is now when you hit someone, they don’t live to tell the tale. Despite your hard exterior, you’ve got a big heart and it’s full of love for Spudsy and your new wife Candy.